I know there is a previous question about this somewhere on SO, but I cannot find it again. 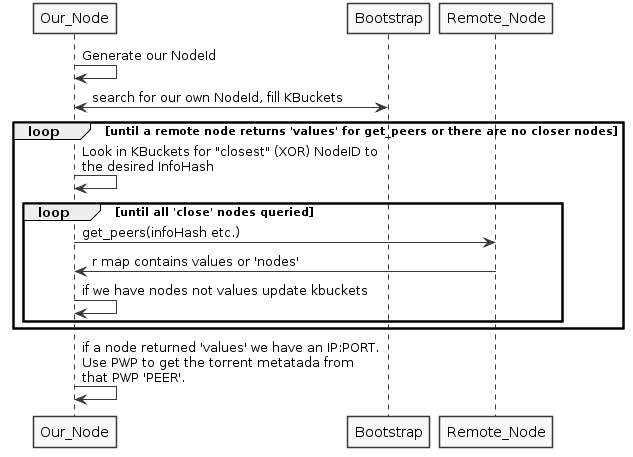 The relationship between NodeId and InfoHash. Is the following diagram roughly correct? I'm trying to implement my own DHT/bittorrent application in Java. I know that there are already some excellent implementations that I will never better. But this is purely a hedonistic pursuit. What was it Kennedy said? "we choose to do this not because it is easy.."
Browse other questions tagged bittorrent dht kademlia or ask your own question. How do I fetch infohash and torrent metadata from DHT nodes without having knowledge of infohash?